On subject: I like this skirt because it comes with a wide elastic waistband therefore I don't even need a belt. It's a lazy girl's dream come true. Off subject: Have I ever told you about the time I let a girl fresh out of beauty school chop about 10 inches off of my hair? (She said short hair was her speciality. 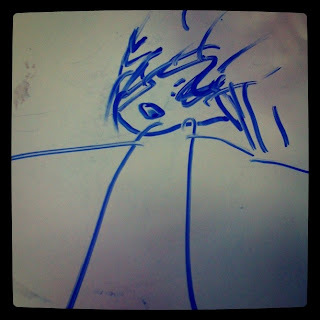 I was powerless.) It was supposed to look like Katie Holmes but instead I looked like a gourd with an ugly wig on*. (This round face can not do short hair. Don't argue with me.) Within minutes, I went from super long hair to hair that couldn't even be wrapped around a curling iron it was so short. As I braved work the next day, I hoped that I was wrong about the cut and that a few compliments would cheer me up. And then no one said a word to me. No one. After about three months of growth did someone finally ask if I got my haircut. How do you know when you've got a bad haircut? When people don't even lie to your face about it. That's when you know. Since then I've let my hair grow with a few trims here and there, terrified of the shears. But looking at these photos I think it might be time for a trim. It's looking a little medieval up in here. The only good thing that came out of that haircut (besides the purchase of Jessica Simpson hair extensions, true story) was that's when I knew Bryan's love for me was real. We'd been married for about 2 months when this happened and every day he still told me I was beautiful. He either believed that or he was the only person kind enough to lie to my face. And that in my book is true love. I wore this outfit last Thursday on a date night with my boyfriend, who just happens to be my husband. (Things are going well, thanks for asking.) It's reached the 100 degree mark here in Texas and it's only May. That means that by August, our house will probably burn down from the heat. We had plans for this weekend. Plans that involved a kiddie pool and pretending that we were back in college. Only one thing stood in our way: food poisoning. B got it and got it bad. No it wasn't from my cooking and no, I didn't poison him this time. (This time!?! Just kidding, I've never poisoned him. Promise.) Poor kid was on the couch all weekend long with me as his nurse. I'm not the worst caregiver, but the only way I know how to comfort someone is with food. Turns out when you've been poisoned by food, being offered food doesn't help at all. Go figure. Luckily for him, it only lasted for 24 hours. And then I made him cookies. Cookies after food poisoning always do the trick. I feel a bit like bleubird vintage today. Maybe it's the hair, the three adorable kids I have with me or the fact that I'm wearing a might-be vintage dress that my mother kindly hemmed for me. (She's cheap too, she let me pay in hugs and hand-me-downs.) Either way, I like it. 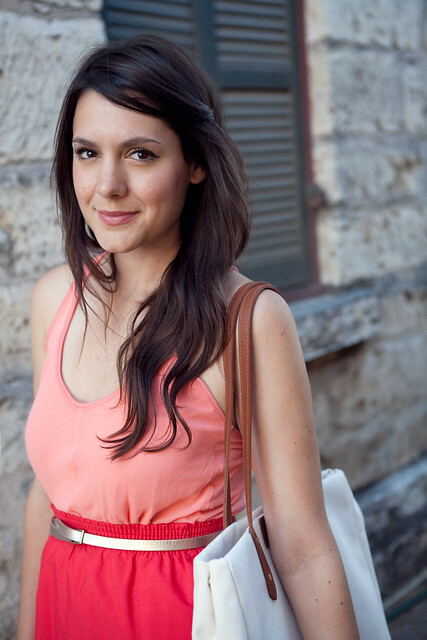 When I first started reading style blogs, I was fascinated -- literally fascinated-- with the way bloggers would wear thrifted or vintage items without looking like Mildred, the previous owner. And while I had thrifted before, I was always on the lookout for ironic t-shirts to wear to my college class, as to look like I didn't care, but I did, but I didn't. All the while I had no idea there were beautiful vintage dresses, blouses, skirts, shoes just waiting to be worn. I've never thought of my style as vintage, maybe a few pieces here or there could pass but let's be honest -- current trends make my heart double beat. 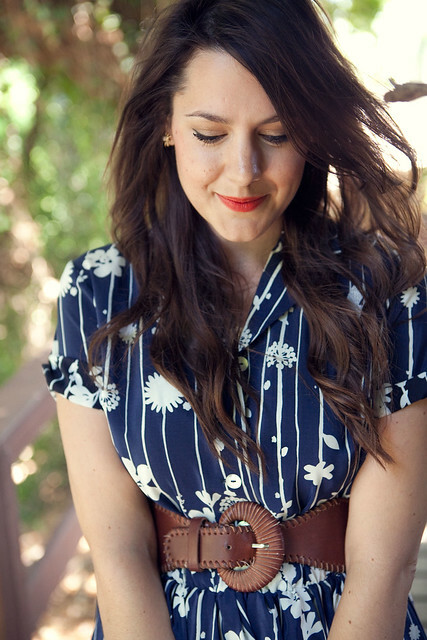 But I've always loved the way some girls can make a vintage dress look so modern and beautiful. And while I loved and envied their style, I've always thought that's just not my style. Not to get all blogmotional on you, but thinking back just two years ago I would have never picked up this dress. I would have never thought "take some inches off the bottom, grab a wide belt and we've got ourselves an outfit." And yet a few weeks ago, I picked this dress up and knew immediately how to wear it. More often than not I still feel like the girl who looks longingly onto blogs, thinking "can I do that?" So as a reader of style blogs, I say thank you to all the girls who inspire me and so many others to try something new. Turns out that you can teach an old blog new tricks. My husband said to me the other day "remember when you hated maxi dresses?" This just goes to prove that you can't tell your husband anything. 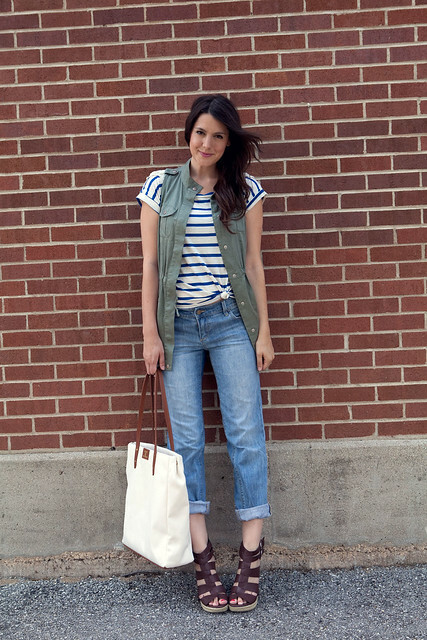 I don't know why it took me two years and style blogging to hop on this trend. Just think, in another two years I'll realize it was never cool to tie my shirt like this. I really wanted someone to ask me what designer I was wearing today so that I could whisper seductively in their face "Claudia". That's the name on the tag of this fine polyester shirt which is part of the reason I bought it. The other reason was because the lady at the store forgot to price it, so when i asked how much she chuckled to herself and said "Oh, honey a dollar. No need to split hairs on this one." Which in thrift store code means she thought this shirt was worthless. Little did she know she had a Claudia on her hands. Who's laughing now, huh? Well I am. But only because I think I'm funny. LOLs. 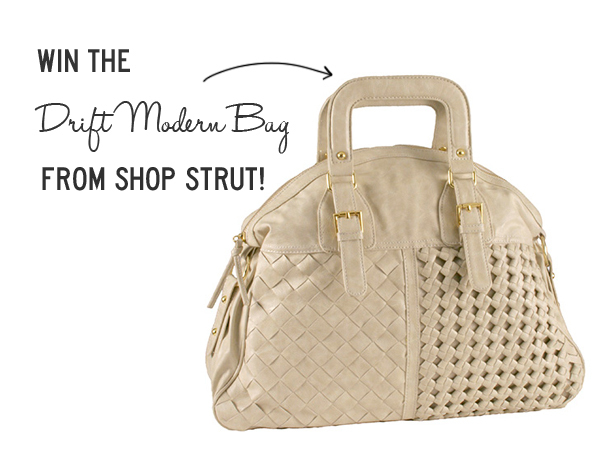 Win a Bag from Shop Strut! 1. Visit Shop Strut and check out the shop. 2. Leave a comment below with your choice of color (cream, caramel, or black). Giveaway open until Sunday, May 29th at 10 pm. One entry per person, please. Congrats, Melanie! Send an email my way! It's getting ridiculously hot here. I didn't even check the temperature today because I could tell it was going to be in the 90s just by looking outside. (Just kidding, I checked the weather. There's no way I can tell the temperature by looking outside, you guys. I'm not a witch.) It's to the point that people look at me weird that I have a scarf around my neck in this heat. From December to March, no one cares. But once April rolls around, the scarf haters come out. And on one hand, I will agree that my neck was a little sweaty, but on the other hand, look how pretty my scarf is. 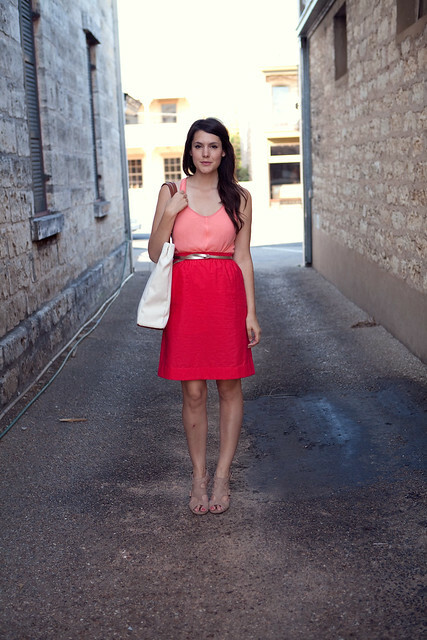 Dresses are a staple for summertime, they are easy and effortless. And most importantly, if I'm wearing a dress, I'm not wearing pants. I'm pretty sure (like 98% certain) that I'm going to live in dresses this summer. I will also live in a house, but that I am 100% sure of. I've decided that a blazer and a dress is my easiest go-to outfit when it's Monday and I'm tired and I can't even remember why I'm awake. Turns out that it is also Kristen Wiig's go-to outfit in 'Bridesmaids' which we saw yesterday. (Hilarious movie, go see it right this minute.) And as I was watching the screen thinking "I love her outfit" the girl next to me leans over to her friend and gingerly says "I hate how she wears those blazers! It's so annoying." But then again she also said that Don Draper was ugly, so I'm not sure about the validity of her opinions. Today we had about 4 minutes to get about 20 photos due to high winds and a rogue skater boy/boi. Good thing I've spent years wasting time watching America's Next Top Model and copying the poses in my mirror. Who needs to read books when I've got the smize to practice? Not this girl. 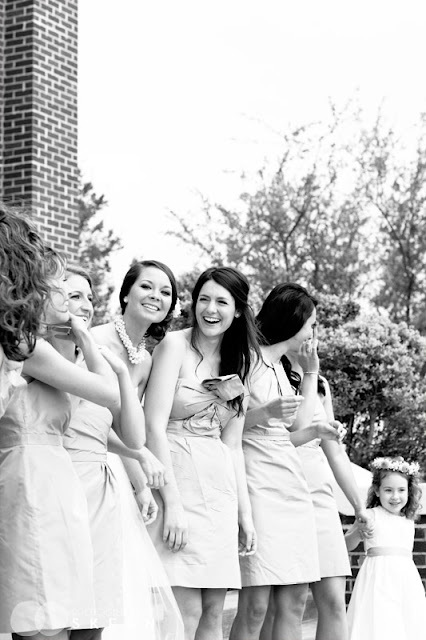 Remember that time I was a bridesmaid? As promised, you can see the photos right here. 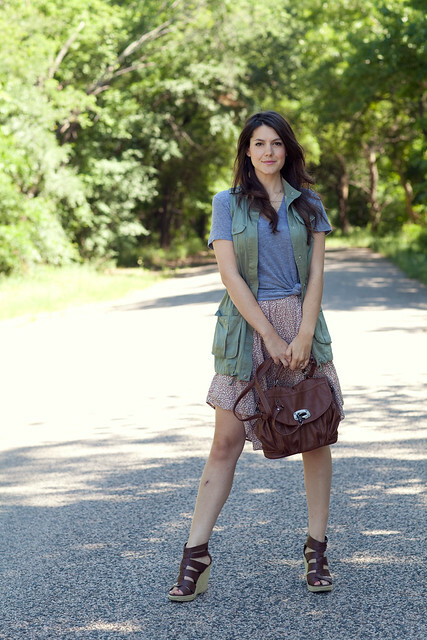 If a days of the week had outfits, this would definitely be Friday's outfit. 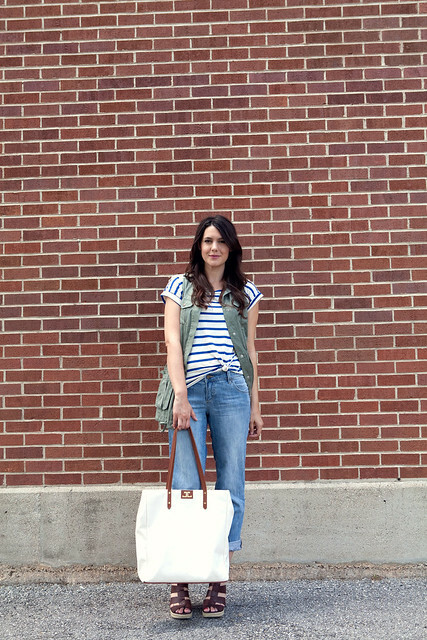 Boyfriend jeans + easy tee + random vest + nice canvas bag that makes me look like I'm carrying large, important documents even though really I'm carrying a bag of Corn Nuts and a laptop. That my friend's is a Friday outfit. 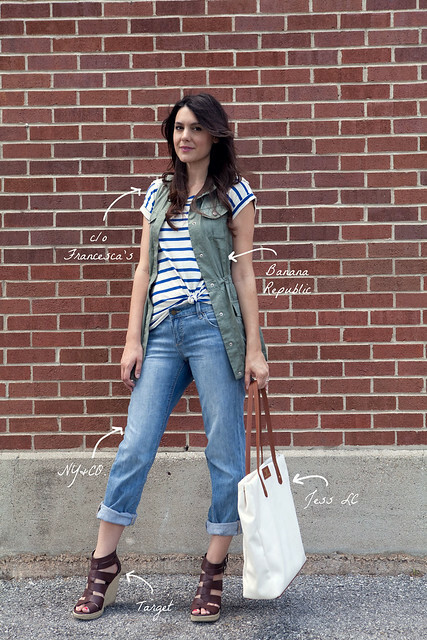 Except with one correction: husband jeans, not boyfriend jeans. I'm a married woman after all. Our plans this weekend? We've got a wedding to shoot and I've got a bed to sleep in. Other than that, my schedule is wide open...for naps. And Corn Nuts. I Did NOT Wear This Today. Just so we're clear, I didn't wear this today. This outfit is actually from last Thursday. (You know the day the world ended. AKA the day blogger didn't work.) I'm gonna be honest, I put about zero effort into getting dressed today, so I'm glad I had this outfit to blog. I guess you'll never know if I had a good hair day today or not. Never. How you will sleep tonight not knowing is beyond me. I got these shoes at Nordstrom Rack for $22 or something ridiculous like that. Even the sales guy was proud of me. It's hard to find Calvin Klein purple suede heels in size 10 for less than $25 but I did it. But you know, I got to thinking about it and these shoes were snubbed by many shoppers if they landed in my hands for so cheap. Either I know something they don't, or I just really like clown shoes. Suede clown shoes, mind you. I have standards. I'm pretty sure that I'm having the best hair day ever. I don't think you understand -- the best hair day I've ever had, ever. There was this one day in 6th grade that could rival this 'do, but from what my memory can dig up, I think today is the winner. I know why my hair looks so good, too. It's because I keep threatening to cut it or get bangs. So listen up hair, if tomorrow doesn't look this good I'm going to go all Rihanna on you. Over the weekend, I was in Dallas. Meaning I was at a Gap. It was a 40% off sale, I couldn't not go. That would be like someone inviting you to a wedding and not going even though you were in town. That's just mean. I'd hate to hurt Gap's feelings, so I lightly browsed for a few minutes and ended up with this dress and a pair of shorts. Shopping is at once my strength and my weakness. Also, there was someone standing right around the corner of this wall. I'm not sure if it was more awkward for him or for us. But to make myself and my hair feel better I'm going to go with him. Win a Necklace from Yellow Heart Art! 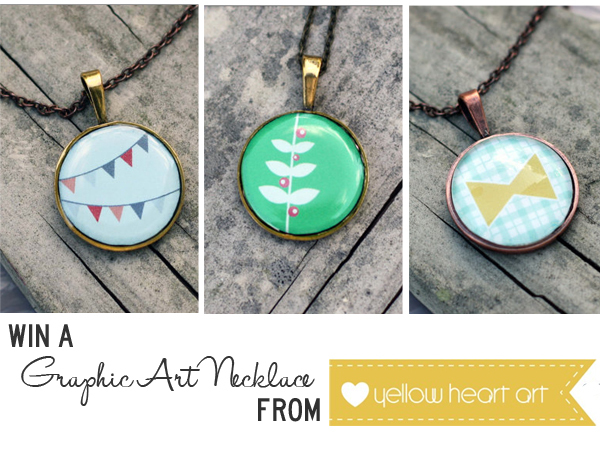 This week you have the chance to win a Graphic Art Necklace from Yellow Heart Art. 1. Visit Yellow Heart Art and browse through the shop. 2. 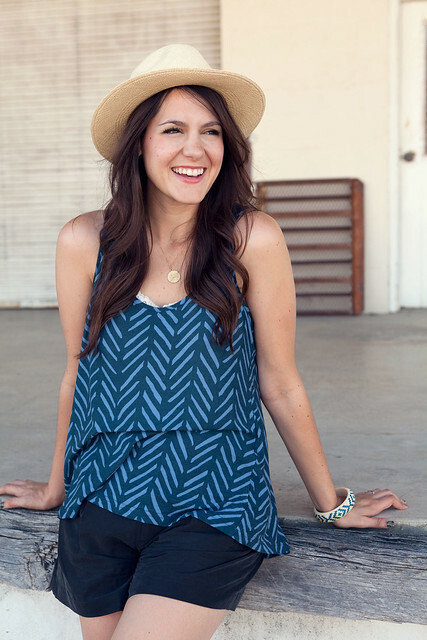 Leave a comment below with your favorite necklace. That's it! Check back next week to see if you're the winner. Giveaway open until Sunday, May 22nd at 10 pm. One entry per person, please. Remember when I coveted this outfit? Well now I've copied it. Which is ten times better than my original plan, which was to steal it. I have this problem. The contents of my closet has somehow ended up on the floor, instead of on hangers. I'd blame my college roommate but she lives 500 miles away. I'd blame my husband but he stopped wearing my clothes years ago. I don't know who has done this to my closet, but I'll find them. And when I do, they are cleaning that hot mess up. As I was saying, it's hard to get dressed when nothing is in order. 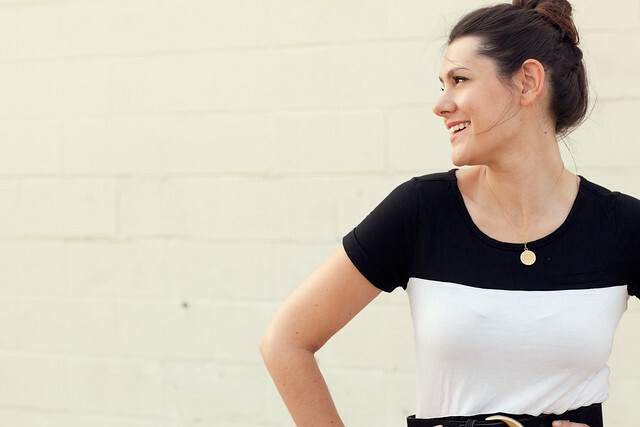 (See: Closet Organization post) That's why this shirt is on repeat from last week. 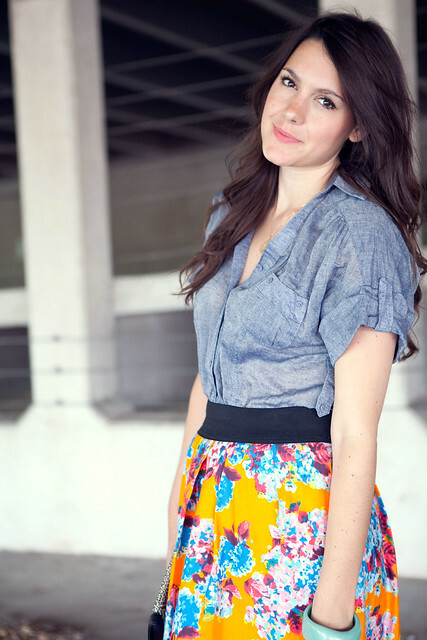 And this skirt? It was thrifted and newly hemmed from my mother. The shoes were the only ones left on the shelf and luckily my bag never found it's way into the dark abyss that is my closet. Looks like I'll have to clean my closet myself or re-wear this outfit tomorrow. I'll keep you updated. This is how I do 90's grunge. You know completely showered and with heels and a cute purse. Only my purse doesn't quite match my shoes -- I'm so edgy and experimental. I think it's the tiny floral print that reminds me of the early 90's and the slightly military vest. Ahh those were the days. When you didn't have to try so hard to look grunge. The arm/leg combo is a bit off, but he's got the lips and the hair just right. 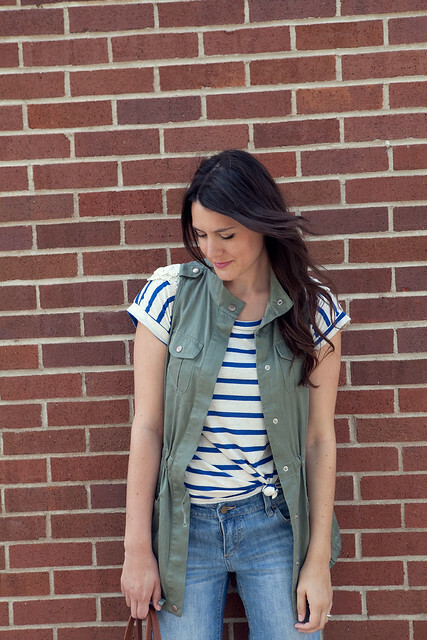 This Outfit says "Thank You"
Win a $40 Store Credit to Adri Apparel! 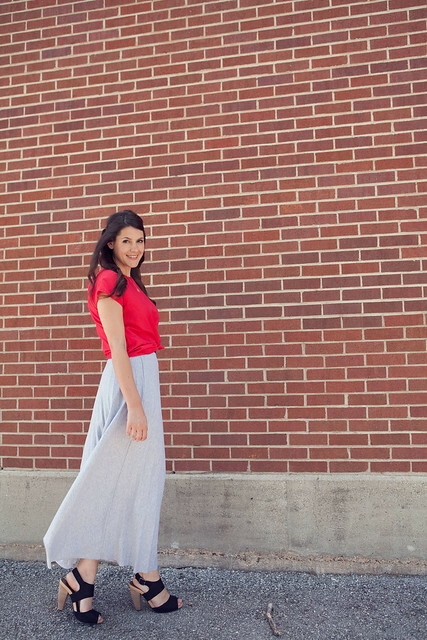 Win a $75 gift card from Jupe Boutique!